They are now together with activists and crew from Canada, Finland, Greece, Italy, Norway, Spain and Sweden. Jim Manly, former MP from Canada, is also on board. Three Israeli nationals are also on board and taking part in the action to break and lift the siege on Gaza. 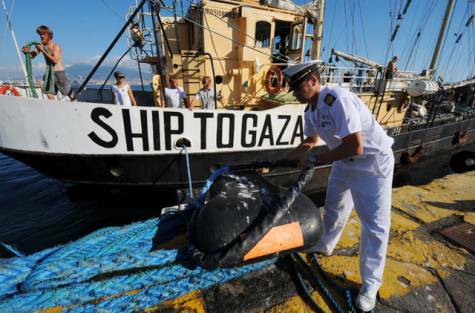 Estelle is expected to reach Gaza tomorrow, Saturday 20 October. The Israeli regime threatens to assault Estelle, in sheer violence of international and maritime laws. Your solidarity is necessary! The acceptance of the honoring invitation to participate in the mission of the sailing boat Estelle, attempting to break the blockade of Gaza, is a way to express once again the solidarity of SYRIZA and of the vast popular majority in Greece, towards the martyred people of Palestine and their legitimate struggle. Together with other parliamentarians I embarked Estelle feeling that, via the organizers of this new solidarity mission, the invitation actually comes from one and a half million isolated people in Gaza, and from all the Palestinians who struggle during decades for their self evident right to Freedom and Dignity. The demand for Bread-Freedom-Independence-Democracy is advanced not only by the peoples that are subject to military occupation or to the expansionist policy of neighboring states. Now it moves from the South to the North of the Mediterranean Sea, reaching all the European South and especially our country. Despite the big differences, a thread is now liking Greece with other countries and peoples in struggle. Recently we realized the importance of solidarity of other peoples with the struggle of the Greek people, the latter being targeted by the international “markets” and the powerful European financial and banking cartels. We know now how it feels to be treated as an outcast. Under these circumstances, we feel encouraged when we hear in other countries the slogan “We are all Greeks”, or when we see the Greek flag waving from Spain to, as it happened recently, Venezuela. Under these circumstances, we are even more obliged to prove that solidarity is mutual. In our region, the Southeastern Europe and the Middle East, the issue of war is on the daily agenda and wider geopolitical rearrangements are being planned at the expense of our peoples. Estelle’s message is a message of peace; a message in favor of international law and human rights, that are overridden in an increasingly violent way in our country and in the broader region. It is a message of resistance to those that attempt to be the gendarmes of the region. Even more, for us Greeks, it is a demonstration of a different “diplomacy” and stance. Estelle’s mission demands that the sovereignty rights and the peoples’ and states’ independence will not be overridden. In short, Estelle’s mission is directly linked to the big mobilizations that are unfolding in our country as well. We will not allow the law of those militarily, politically or financially powerful to prevail. We will impose Justice and Democracy. The Mediterranean Sea can be transformed: from an area of external invasions, of looting of natural resources of its countries, of civil strife and hatred, of austerity programs and social extinction, into a sea of Peace, Dignity and Prosperity. In this sense, despite the gray background, the Arab Peoples uprisings, the squares movements in Southern Europe, the Palestinian Resistance and the struggles of the peoples of our “neighborhood”, pave for us all paths of hope and victory. Occupied Jerusalem: Israeli troops on Saturday boarded a boat carrying pro-Palestinian MPs and activists seeking to run its naval blockade on the Gaza Strip, blocking the latest attempt to reach the enclave by sea, the military said. The operation, which the military said was concluded peacefully, ended the latest bid by activists to breach Israel’s tight maritime embargo on Gaza which prohibits all naval traffic in and out of the Palestinian coastal territory. “A short while ago, Israeli navy soldiers boarded (the MV) Estelle, a vessel which was en route to the Gaza Strip, attempting to break the maritime security blockade,” the military said in a statement, indicating the Finnish-flagged vessel was being led to Ashdod port in southern Israel. On board the ship are 17 passengers, among them five parliamentarians from Europe and a former Canadian lawmaker, organisers said. It was also carrying a shipment of humanitarian aid and 30 doves, which the passengers had been intending to release on arrival in Gaza. The announcement came shortly after organisers told AFP that the ship had “come under attack” after being approached by navy vessels some 38 nautical miles off the Gaza coast. The military said the boarding was carried out only after “numerous calls to the passengers onboard” which went unanswered. On arrival at Ashdod, the ship’s passengers would be handed into police custody and then onto the immigration authorities. Activists on previous Gaza-bound flotillas which were stopped by the navy have all been taken to Israel and immediately deported. The vessel had set sail from Sweden several weeks ago, stopping off in Finland, France and Spain before leaving the Italian port of Naples on October 6. “The Estelle is now under attack – I have just had a message from them by phone,” Victoria Strand, a Stockholm-based spokeswoman for the Ship to Gaza-Sweden campaign told AFP at 0830 GMT. Among those on board are parliamentarians Ricardo Sixto Iglesias from Spain, Sven Britton from Sweden, Aksel Hagen of Norway, and Vangelis Diamandopoulos and Dimitris Kodelas, both from Greece. Former Canadian lawmaker Jim Manly is also on board. Strand said the Estelle, which has previously been used in Greenpeace missions, had been expected to dock in Gaza late Saturday afternoon. Activists organised a major attempt to break the Israeli blockade in May 2010, when six ships led by the Turkish-owned Mavi Marmara tried to reach Gaza. Israeli troops stormed the Marmara, killing nine Turkish activists and sparking a diplomatic crisis with Ankara, which expelled the Israeli ambassador and has cut military ties with the Jewish state. Since then, there have been several other attempts to reach Gaza by boat, all of which have been stopped by the Israeli navy, although there has been no repeat of the bloodshed. In July 2011, another flotilla tried to set sail for Gaza from Athens but several of the boats were unable to sail due to what organisers said was sabotage, while others were banned from leaving by the Greek authorities. Another attempt in November saw an Irish and a Canadian ship blocked from reaching the Palestinian territory. Israel says its blockade is necessary to prevent weapons from entering the coastal territory, which is run by the Islamist Hamas movement. Last year, a UN report on the flotilla raid accused the Jewish state of acting with “excessive force” but found that its naval blockade on the coastal territory was legal.